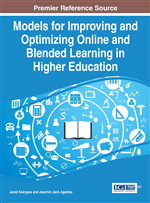 The increase of blended instructional offerings in brick-and-mortar institutions provides leverage for the appropriate utilization of technology for instruction to optimize learning and serve a generation of learners who prefer such environments. However, the question of appropriate use of technology to improve student performance rests on teacher belief. Where faculty believe that they are content experts who should be trusted to deliver instruction as they see fit, the integration of technology becomes a choice. Some faculty see a clear demarcation between curriculum development and instruction as two separate processes involving separate activities (Heinich, 2011). The missing link appears to be a lack of appreciation for the benefits of instructional design principles that increase learning outcomes as a result of interactivity. This chapter focuses on the need for the inclusion of instructional design principles for in-service and pre-service teacher professional development to assist faculty transition effectively to blended instructional delivery. Barriers that impede the appropriate use of technology for blended delivery need to be identified and alternative approaches need to be applied to assist instructors and increase the effective use of technology in blended learning environments that are more learner-centered. Rogers’ (2003) observation that it takes time for a new innovation to be adopted and implemented appropriately is still relevant today, particularly with the integration of Course Management Systems (CMS), in brick-and-mortar institutions of higher education. In spite of the widespread use of CMS for blended instructional delivery, and the positive claims on learning gains associated with it, problems still abound on their proper implementation. For brick-and-mortar institutions, blended learning environments are a natural fit because they provide a bridge between traditional practice and online education. Blended instructional offerings also provide revenue (Yuan & Powell, 2013) as some students prefer the benefits of a traditional face-to-face and online combination. Teaching and learning with blended formats provides a learning environment that enhances “real time” interaction with learning materials, discussions with instructors and among colleagues, and the facility of providing actionable feedback without having to wait until the “next class meeting”, as is the case with the traditional learning environment alone. A driving factor for the increased use of blended learning environments is that majority of students currently attending college consist of a generation who are accustomed to experiencing real time results from interacting with technological tools (Hartman, Dziuban & Brophy-Ellison, 2007). Such learners have therefore come to expect the similar experiences of “convenience and flexibility” from their learning process (Lin, 2009, p. 58). However, it is this expectation that is driving two competing legacies of thought and fundamental preferences, among others, on teaching and learning practices in the 21st century. This is mainly because many faculty who are accustomed to traditional delivery and have learned that way themselves, see nothing wrong with continuing the same practice (Heinich, 2011). Yet interaction with content, as made possible by the distance aspect of blended environments is central to learning outcomes (Rhode, 2009). This reality is consistent with expectations of the current generation of learners who prefer technology to play similar roles in their learning the way it does in their lives. Educational technology, through the use of CMS, provides essentials for these alternative learning environments, making learner interaction with knowledge objects possible (Nycz & Cohen, 2007). As a consequence, CMS also dictate alternative methods of instructional delivery that are necessary for their successful adoption. The goal of this chapter is to focus on the use of Course Management Systems as a student-centered learning environment, particularly with regard to issues concerning its effective and appropriate use as a blended learning environment for instructional delivery in brick-and-mortar institutions. The discussion centers on current practices in the utilization of blended learning environments with a focus on values of “student-centered learning environments (SCLEs)” as discussed by Land, Hannafin and Oliver (2012, p. 3). I argue that faculty professional development on CMS use should first focus on assisting instructors understand technology tools and their inherent variations relative to applicable theoretical frameworks as a precursor to the standard practice of assisting faculty learn to implement those tools. Course Management Systems, through a collection of software applications, provide a virtual environment for learning and interaction not only between instructors and students, but among students as well (Betrus, 2008). Course Management Systems therefore provide access to course materials such as syllabi, assignments and quizzes, grades, links to related websites, tracking tools, feedback, and discussion forums that facilitate communication. The range of CMS available in higher education include, but are not limited to, Blackboard®, Moodle®, CourseInfo®, Desire2Learn®, eCollege®, Moodle, Sakai®, and Brain Honey®. Course Management Systems is sometimes used interchangeably with Learning Management Systems (LMS) because the latter is a corporate version of the former (Betrus, 2008). Moodle, an abbreviation for Modular Object-Oriented Dynamic Learning Environment, is used to provide examples where necessary. Nonetheless, the discussion is applicable for other CMS.